Writing and publishing a book sounds like a massive undertaking. Not only do you need to feel like you have something concrete and useful to say — or narrow down the million things you want to say into one key message — but then you have to sit down and write the darn thing! It is certainly a big project, but in reality it’s easier than it first appears. You might be groaning as you read that, but I promise you when we set out to co-author our first book, Meeting of the Minds: The Social Entrepreneur’s Roadmap to Collaborations that Work, we had no special secret powers that you don’t have! To make publishing a book a reality, you just need a solid plan to guide you through each step. And then I promise you can do it too. In an online world that grows by over 3 million new blogs posts every day (according to Worldometers), books are still the best resource for sharing in-depth ideas. Books are bound by a key message or big idea, and stay nicely contained for future reference, unlike many other learning formats these days. As business strategist Charlie Gilkey has pointed out, books are an amazing opportunity to create a one-on-one experience between the author(s) and the reader. Again, this is a result that is rarely created in other online content, where the noise of the internet threatens one’s attention span at any given moment. For all these reasons, organizing your world-changing ideas into a book is incredibly effective for scaling your impact. As individuals who had been serving social entrepreneurs online, we had been organically growing our partnership for about nine months when we decided to take the plunge and co-write a book together. It didn’t necessarily have a direct business benefit that fit into our plans at the time, but it was a topic we felt compelled to share our ideas on (more on that later). Bigger even still, is that a book is an amazing format to scale impact. We knew we had a message that needed sharing. We could have done more live events on the topic to build off our very first live #Socent Lab Q&A Call (all about the topic of collaboration!). We could have written a blog to share on social media, and so on. But we knew to really truly shift the way changemakers collaborated, we need to go deeper. We knew we needed to create something extremely user-friendly, practical, and ultimately a tool that would be effective to create the change we were seeking. Side note: If you want to learn more about how our partnership grew to a place where we were able to take on this project together, click here to download a chapter from our book, Meeting of the Minds: The Social Entrepreneur’s Roadmap to Collaborations that Work. In this free download, you’ll get a behind the scenes look at how we started the Global Social Entrepreneur’s Lab as well as how a call for advice kicked it off from the very beginning, how our partnership grew and evolved over time, and the 7 key success factors that led us to where we are today (nearly 900 members in the Lab, a book, and the launch of Changemakers Association). First off, you need to eliminate the pressure of having to summarize your life’s work in one piece of writing. You might feel like the first book you write needs to be a well-rounded representation of everything you have contributed to the world so far, but you can let this go! Not to say that couldn’t be a book you write at some point, but it by no means needs to be (or should be) your first book. Our book on collaboration was somewhat of an accident… That helped eliminate pressure to write something amazing, as mentioned above, but it also meant our scope was well-defined from the beginning. The reason we wanted to write this book is that we found ourselves having similar conversations over and over again, and we saw a clear and tangible need for a practical guide to collaboration, especially designed for social entrepreneurs. Guaranteed you have had this conversation at some point or another! And that’s exactly why we wanted to outline a roadmap to guide social entrepreneurs through building effective and mutually beneficial collaborations. There are so many reasons we need to work collectively that it is essential we (social entrepreneurs / changemakers) finally prioritize consciously building our ‘collaboration muscles’. What conversation do you find yourself having over and over again? What talking points, or advice, do you find yourself repeating in several conversations with different people? You will be tempted to over analyze your topic, add more ‘meat’ to it, and generally confuse the matter. Trust us, it really doesn’t need to be more complicated than defining the scope around a conversation you have over and over again. Keep it simple. With your scope defined, the next step is to prepare an outline. Again, this step can feel daunting. You’ll find yourself wanting to add in more sections, more background, more context. Try to contain yourself. You have heard the age-old saying, ‘you can’t be everything to everyone’, and it holds true for your book. There are millions of books in the world for a reason! Even the same subject can be tackled from hundreds of angles. Do you want to write a practical guide, an exploration or summary of existing knowledge and theories, or present a new wild way of looking at something? Or something else? Each of these styles applied to the same subject will result in very different books. What is your style? And what is your goal? If your goal is to use your book to build your audience, think about what questions and considerations your ideal customer has before they are ready to work with you. Perhaps your book can guide your potential customer along with a journey or conversation that brings them to a place where they are ready to work with you. If so, let this goal guide your outline. Anything you really want to write about that doesn’t serve that goal can be saved for another book! In our case, the goal was simply to share our learning, experience, and advice about how to collaborate effectively as a social entrepreneur. This is by far the most challenging step, but if you are clear on your scope, outline, and reasons for writing the book, it will be easier! Block large chunks of time to dedicate solely to writing. When you sit down to write, don’t fret about the details, just see which part of your outline is calling to you that day and start dumping everything you are thinking onto the page. It’s super important to only write — save any editing or re-organizing for another sitting. In our case, we split our outline into sections that each of us would write, and this effectively split the work of writing in half. At one point each of us were uninspired by one of our sections, and so luckily we swapped sections for a better fit, and this helped keep the momentum strong. If you don’t have a co-author, don’t let yourself get stuck looking a blank page when a section you planned is suddenly less inspiring. Move on to another section, and chances are when you go back to the area you were stuck on, it will be easier. Editing is probably the second hardest step. But again, it can be managed fairly easily. Thanks to our co-authoring Meeting of the Minds, we had the benefit of every part of the book going by two sets of eyes, so we edited ourselves. If we did it again or were to do an updated edition, splurging for a professional editor is probably worthwhile (while not absolutely necessary). If you’re writing on your own, you can find editors at a range of rates to work on everything from strictly grammar and punctuation, all the way to help you structure your idea at the broader level. For both editing and design help, a platform like Fiverr is a great place to start looking for help. This step might sound the most complicated, but these days with the high prevalence of online and self-publishing it means that you have several tools available to you to make this step as easy as hitting print to PDF in your word document. Readers are used to enjoying books in PDF or Kindle formats so you don’t even need to worry about setting up a print option if you don’t want to. If you do want to have hardcopy books available, you can use Create Space (an Amazon company) like we did, and once your book is set up there are no minimum orders like there used to be in self-publishing! A reader can simply click buy on Amazon and a hard copy of your book will be printed on demand and sent by snail mail; you only pay for the cost of printing when someone buys, which means you hold zero inventory risk. To help with Kindle formatting you can look into Pressbooks. Otherwise, simply set up your book in your favourite word processing program (like Word or Pages) and save as a PDF. There are so many tips and tricks for marketing a book online these days! We will have to save the full review for another article, but for now we’ll share this: Don’t be shy! You put all that time and effort into writing and publishing your book… Stopping before you get your book into the hands of those who can benefit from it would be a huge disservice. Ask friends, family, and colleagues to help spread the word, share regularly on social media and with your existing audience, and make sure you have a page on your website that lets people know why you wrote it and what it will help them do, be or achieve. Writing a book is an incredible way to scale your message and your impact. So don’t wait too long to get your book into the world; it doesn’t have to be perfect, it just has to be shared! 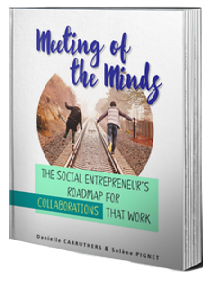 To learn more about how our collaboration got started and led to co-authoring a book together, click here to download a chapter from Meeting of the Minds: The Social Entrepreneur’s Roadmap to Collaborations that Work. In this free download, you’ll get a behind the scenes look at how we started the Changemakers Lab as well as how a call for advice kicked it off from the very beginning, how our partnership grew and evolved over time and the 7 key success factors that led us to where we are today.